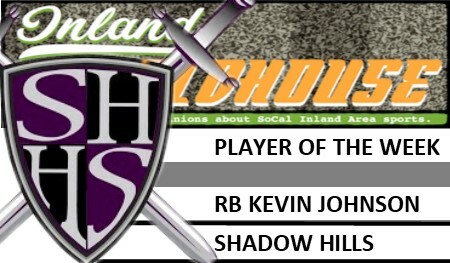 Indio Shadow Hills senior RB Kevin Johnson has been selected InlandFieldhouse.com’s Player of the Week after his Week 4 performance in a 55-16 victory over Hemet in a nonleague game on Friday, Sept. 14, 2018. Johnson rushed for a career-high 356 yards and five touchdowns for the Knights (5-0 overall), which is off to their best start in Shadow Hills’ 10-year history. The 6-foot-1, 186-pound athlete also passed for a 40-yard touchdown and had one receptions for 14 yards in the win, Shadow Hills’ third consecutive over Hemet. Johnson now has rushed for 778 yards and 14 touchdowns this season, placing him in the Top 10 in the CIF-Southern Section in both rushing yards and scoring.